Shortened forms of words like automobile (auto), examination (exam), mathematics (math),common in conversation and informal writing, are usually used in their entirety in formal contexts. These shortened words are called clippings. Sometimes a clipping drives out its longer original and becomes a standard word in its own right. Back-Clipping - When back-clipping occurs, the beginning of the word is retained. 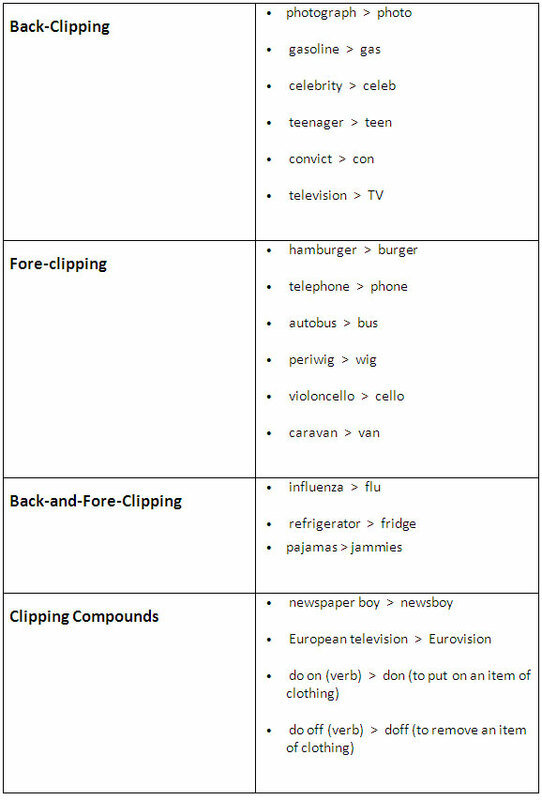 Fore-clipping - When fore-clipping occurs, the end of the word is retained. Back-and-Fore-Clipping - When back-and-fore-clipping occurs, the middle of the word is retained.